In many cases of signal processing, using only FIR digital filters is preferable since FIRs with symmetrical impulse response will give an exact linear phase response. Linear phase response is very important for video signal processing. Some applications require baseband filters with very steep rolloff and high stopband attenuation; with the passband much narrower than the stopband. To achieve these requirements, a high order FIR with high precision coefficients and respectively high precision multiplications is required. This means that the complexity of the filter is high. 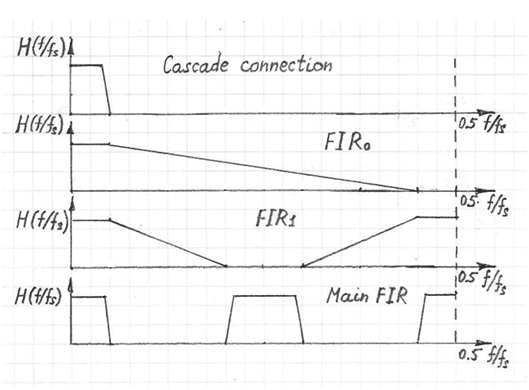 To decrease the complexity, a cascaded connection of filters with downsampling after each cascade is utilized. In many cases it performs a downsampling by 2. Each filter, except the last one, plays the role of pre-filter for the next filter in the cascade connection. The pre-filter has to attenuate only those frequencies that will be aliased to the passband after downsampling. Finally, the last filter has to extract the spectrum of the filtered baseband signal.